Governor Bridwell Receives Swedish Royal Honors. Home / SCS Headlines / Governor Bridwell Receives Swedish Royal Honors. MAY 2013: His Majesty King Carl XVI Gustaf bestowed Society Governor Margaret Sooy Bridwell with the Royal Order of the Polar Star in a presentation made during the Reception prior to 375th New Sweden Jubilee Dinner. The King is the Society’s High Patron. Ambassador Jonas Hafström praised Governor Bridwell for her leadership role in adding the Peter S. Craig Collection and the Ronald S. Beatty Collection to the Society’s holding’s to create the world’s largest collection of genealogical and historical material relating to New Sweden and the colonists. The Order of the Polar Star is a Swedish order of chivalry created by King Frederick I in 1748, was intended as a reward for both Swedish and foreign “civic merits, such as devotion to duty, for science, literary, learned and useful works and for new and beneficial institutions”. Since 1975 it is presented only to foreigners or members of the Royal Family. Mr. Chris O’Neil, the American who married Her Royal Highness Princess Madeleine, was bestowed with the Order of the Polar Star just before the wedding ceremony in Stockholm. Mrs. Bridwell is an 11th generation descendent of Olaf Stille and Hans Månsson, his future son in-law who both arrived from Sweden in 1641. After Hans’s marriage to Ella Stille, the Månsson name evolved into Steelman, a distinguished family name along southern New Jersey coastal areas. 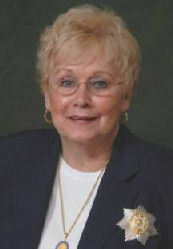 “Sally” Bridwell is a retired career educator who graduated from Rowan University and earned her master’s degree from Temple University. Governor Bridwell and her husband, Nagle, reside in Berwyn, PA. They have two children: Mark, in Boston, MA; Jennifer and her husband, Ted, in Douglassville, PA; and six-year-old twin granddaughters, Margaret and Miranda. Previously Mrs. Bridwell served the Swedish Colonial Society as treasurer, junior deputy governor and senior deputy governor. The Governor also serves on the Board of Directors of the Swedish Council of America, Minneapolis, MN; the New Sweden Colonial Farmstead, Bridgeton, NJ and the New Sweden Centre, Wilmington, DE. She is a member of the Kalmar Nyckel Foundation and the American Swedish Historical Museum.